It was just 11 days ago, on January 8th, 2018, when University of Alabama head football coach Nick Saban once again hoisted the National Championship Trophy after his Crimson Tide team surmounted an improbable comeback to beat their arch rivals from the University of Georgia 26-23 in overtime. For the legendary coach, the postgame celebration was nothing new as it marked the 5th time his team has been crowned champions in the past nine seasons and the 6th time in his storied career. 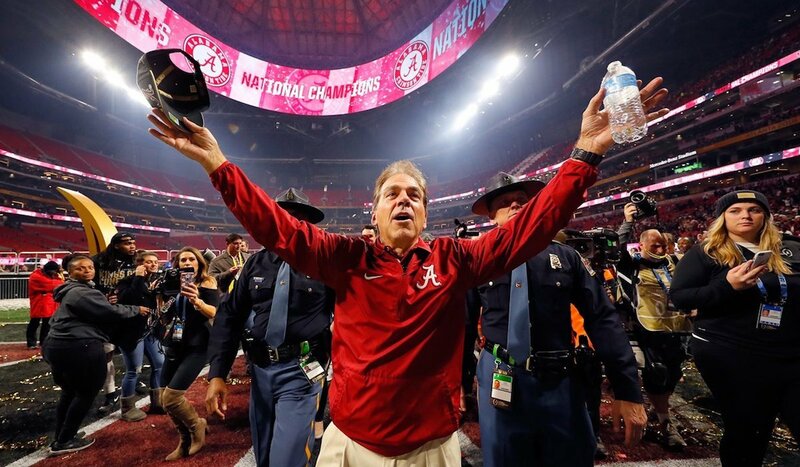 With trophies and accolades pilling up on a seemingly annual basis, in an industry where competition is fierce, Saban’s inconceivable levels of success have captivated the sports world and further exasperated the opposition. Before being named as the 27th head football coach in University of Alabama’s history on January 7th, 2007, Nick Saban honed his coaching prowess while leading the programs of three other highly respected universities and the Miami Dolphins of the NFL. It was during his tenure at Michigan State University (1995-1999), his first major collegiate job, when the now iconic coach began formulating the ‘process’ which eventually led to six championships and a place amongst the greatest college football legends of all time. It was during the 1998 season, to be exact, when a then 47-year-old Saban, who’d become passionately curious about sports psychology, began consulting with a psychiatry professor named Dr. Lionel Rosen about the mental aspects of coaching and playing the game. As the team was preparing for their biggest game that year, on the road in hostile territory against top ranked Ohio State University, Saban had Rosen teach his players a form of process thinking that was originally popularized by the legendary founder of Cognitive Behavioral Therapy (CBT), Aaron T. Beck. What the eccentric psychiatry professor, who’d soon garner the nickname ‘Lonny Graybeard’, taught the team was to focus all of their efforts on winning one play at a time and not to worry about the scoreboard or how much time was left in the game. Although the Spartans fell behind early and still trailed in the 3rd quarter by a score of 24-9, they mustered a miraculous comeback and pulled out the unlikeliest of victories 28-24. It was directly because of what occurred on the field that day in Columbus that Nick Saban’s process was born. Based upon what’s been discussed up until this point in the article, we now know that Nick Saban’s been able to achieve iconic levels of success by developing and relying upon a champion’s mind. While there will only be a selective few number of individuals who’ll be fortunate enough to learn the winning formula from the legendary coach himself, this doesn’t mean we can’t utilize Nick Saban’s process in our own lives. Above we outlined six of the most important mental and behavioral practices that Saban and his teams relies upon, and each of us can individually use these to measure ourselves while on the methodical grind towards greatness.